According to the Office of the Surgeon General, the number of Americans who celebrated their 65th birthday has reached 46 million, with an expected projection of 74 million by 2030. Advancements in medical field and improved lifestyles are the reasons for increased life expectancy. While the federal government and families largely benefit from the contributions of older adults, the challenges of meeting their needs are never ending. Aging takes a toll on physical health leading to an aged brain and weakened heart, which is the major cause of memory loss and death, respectively, among older people. 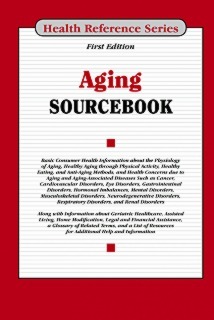 Aging Sourcebook, First Edition provides information about physiology of aging, impact of stress on aging, and how the brain’s health can make a difference. It also discusses about healthy aging through physical activities, healthy food habits, and immunizations. The book provides information on aging-associated diseases and medical conditions such as cardiovascular disorders, eye disorders, instability, mental disorders, musculoskeletal disorders, neurodegenerative disorders, respiratory disorders, and more. It also offers tips on using medicines safely and improving the quality of life. Suggestions for Medicare assistance for treatments, getting help with caregiving, pension counseling, and end-of-life care are also provided. The book concludes with a glossary of terms related to aging and a directory of organizations that provides information about aging. Part I: Physiology of Aging (Gerontology) defines aging and discusses the biology of aging process and factors contributing to life span. The role of genetics, metabolism, and immune system in the physiology of aging is described. This part contains statistics related to the aging population in the United States, the U.S. federal government’s role in advancing healthy aging through the National Prevention Strategy, and the cost of healthcare for the aged. Part II: Healthy Aging gives an overview of ways in which one can age in a healthy manner. This part emphasizes on exercise, physical activity, and eating habits and also describes various anti-aging methods. Various concerns such as mental health, forgetfulness, coping with the loss of loved ones, and emotional health are discussed. Details on immunizations to prevent flu and shingles are also provided. Part III: Aging Associated Diseases and Medical Conditions describes various age-related problems like cancers, cardiovascular disorders, eye problems, gastrointestinal disorders, hormonal imbalances, mental disorders, musculoskeletal disorders, degenerative conditions, respiratory problems, renal disorders, and substance abuse. Other conditions related to aging such as fatigue, hearing loss, sensory impairment, and sleeping disorders are also discussed. Part IV: Geriatric Healthcare provides general information and guidelines on healthcare for aging individuals. Essential details about nutrition, pain management, medication, assistive technologies like hearing aids, complementary care, and personal safety measures is detailed. The benefits of leading an active lifestyle is explained. Part V: Aging in Place discusses various options on assisted living, home care, nursing home care, and retirement communities. Long distance caregiving, long-term care, and end-of-life care are explored in detail. Part VI: Legal and Economic Issues with Aging examines legal issues with respect to advance care planning and getting your affairs in order. It also provides information on health coverage, financial assistance, and claiming earned benefits through pension. Part VII: Additional Help and Information provides a glossary of important terms related to aging and a directory of organizations that offer information for aged people.